Optimized inverse planning can yield superior treatment plans, especially in complex situations with convex-concave target volumes and nearby critical structures; however,the optimization criteria must be carefully chosen. Determining appropriate optimization criteria is not straightforward and requires some trial and error in a “human iteration loop.” Using current commercial inverse planning systems this process can be quite time-consuming. Experienced treatment planners know how to steer an IMRT plan in the desired direction by appropriately changing the optimization criteria. Also, class solutions can help to avoid or reduce the “human iteration loop” in cases that do not vary too much between individuals, such as prostate treatments, because optimization criteria can be re-used. Nevertheless, plan optimization leaves something to be desired. 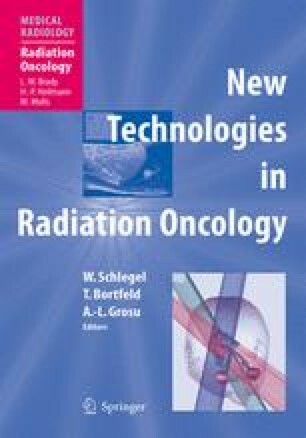 The main problem is that it may not be possible to come up with a quantitative, complete optimization formulation for radiotherapy planning in the near future; however, an achievable alternative is to design optimization systems that let the physicians exercise their experienced clinical judgment or intuition in the most direct interactive way. Therefore, some future developments aim at a more interactive approach towards inverse planning. Multicriteria optimization and navigating a treatment plan database have been described as promising approaches in this context.